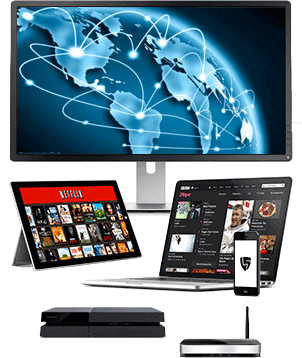 Instant setup – one subscription with unlimited access to our VPN & Proxy networks. VPN & Proxy for anyone from anywhere. Our Tier 2 hybrid network is Superfast and offers unlimited global access. Hide your IP address from spies and hackers by encrypting your Internet traffic. Avoid geoblocks and government imposed restrictions to access any website. Optimisation of our network, peering agreements and global routing is an ongoing process aimed to provide our customers with speed fast enough to watch video streaming without any buffering. We offer unlimited data packages along with SSL secured 256-bit encryption. Our software VPN and Proxy Server Solutions can be configured on a whole range of computers, tablets and smartphones from anywhere. Furthermore, we offer pre-configured VPN Routers which allow you to connect any device to your VPN, including games consoles and video streaming devices. Our helpdesk team are fanatical about helping our customers and contactable 365 days per year. Users are guaranteed a fast, friendly and jargon free response by a fully trained staff member via telephone, email or live chat. We offer a free 48hr trial on our VPN and Proxy network. We are confident that you will be 100% satisfied. If you are not, simply cancel in before the 48hr trial expires and you will not be charged. Inclusive connectivity software and/or manual setup guides for L2TP/IPSec, PPTP and OpenVPN connections. Fanatical technical support offered 365 days per year via telephone, email or livechat.